The Library has recently acquired a celestial pocket globe from c1791 by London globemakers John and William Cary. The globe forms a pair with a Cary’s terrestrial pocket globe already in the Library’s collections, acquired in 2009. The first known printed celestial globe was produced in c1533-4. Celestial globes require the user to image the earth at the centre of the sphere, the viewer situated beyond the universe, looking down on the stars below. In this way, they are the inverse of a terrestrial globe, but are complementary, going together to form a complete view of the universe as it was known at the time of production. This celestial globe includes a number of constellations including the Southern Cross and illustrates the known stars and constellations of the Southern Hemisphere to 1791, its approximate year of manufacture. 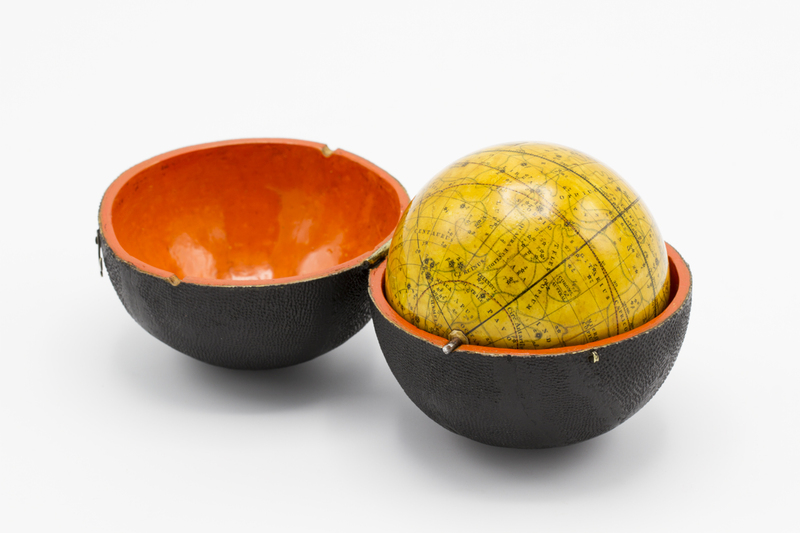 The globe comes with its own case made of sharkskin; the orange lining appears to be original. 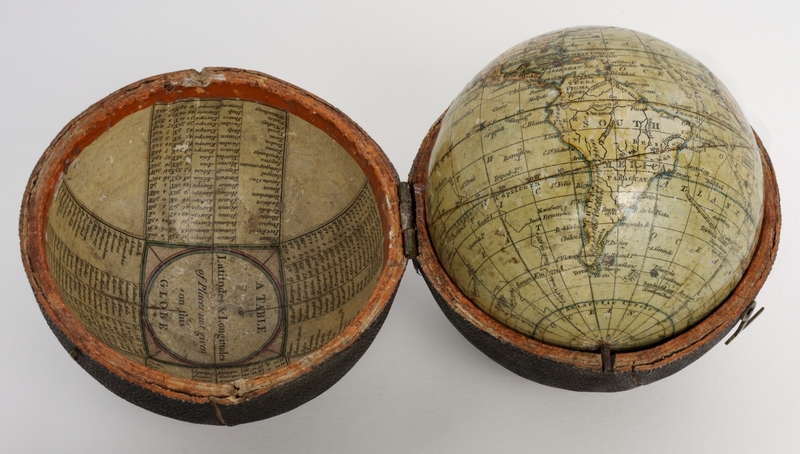 Celestial globes were used for shipboard navigation, however this globe, in its pocket-sized form (only 90mm in diametre) was more likely to be intended for children’s educational use, entertainment, or purchased for its general portability and ease of travel. The first pocket globes appeared in the 1670s, and become increasingly popular in the late 18th and early 19th centuries, to a public fascinated with global exploration and geography. Celestial globes declined in popularity from the early 1800s onwards, as more was discovered about the skies and star atlases and star maps began to be published, which had the ability to show a lot more detail than on a globe. Celestial and terrestrial globes were almost always sold in pairs, though matching pairs of pocket globes are quite rare today.